11:18 am :: Biggirl's record breaking banana pepper. Biggirl's record breaking banana pepper. The above is not my record breaking banana pepper. 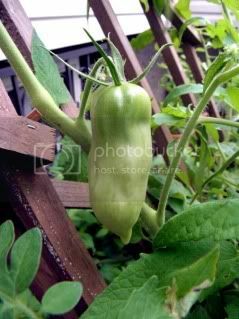 That's a roma tomato I just noticed being rather large and lumpy. He's masquerading as a banana pepper. 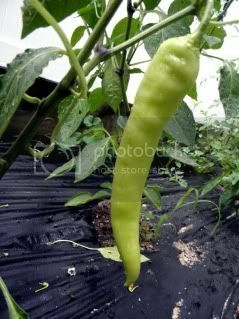 Not so impressive in the picture since there's nothing to compare it to but it is the largest banana pepper I've ever grown. It is bigger than my head. I'd say it's about a foot long. And it's still growing. I also need to find me some lettuce and cabbage seeds to fill the bed that held the garlic. Although I don't hold out much hope for them. Our resident robin, Rocky, will surely eat all the seeds. Here is this year's marigold border. Still a bit weedy but much better than last year and a thousand times better than the year before. I don't know what else I can do besides the landscaping cloth and mulch. Weeds are tenacious motherfuckers. Those tall marigolds in the middle? They are the ones that made it from the indoor February start. 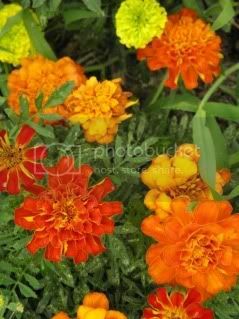 Also, why not a close up of the pretty marigolds? It's never too late! Go get flowers and put them in right now.